Provide constant cooling for up to 3-4 hours. Lightweight vest weighs 3.7 lbs. to 5.5 lbs. Weight may be adjusted by varying the number of cooling packs used. AllegroMedical.com presents The Kool Max Zipper Front Cooling Vest. Polar Products is the only manufacturer offering every major type of personal cooling technology and our product line is always growing! You can feel confident knowing we offer the best value and most effective products for your specific application and climate. Frozen water-based Kool Max Cooling Packs fit into insulated pockets in vests and accessories. Lightweight and efficient packs cool the body in any environment. 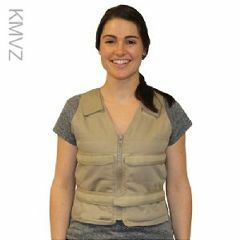 The lightweight Kool Max Zipper Front Vest efficiently and effectively cools the body in any environment, under or over clothes. Patent pending. Frozen water-based cooling packs fit into insulated pockets in vests and accessories. Non-toxic and chemical-free Kool Max cooling packs are made of biodegradable materials. Packs are reusable and should last for years with proper care and storage. To use, place the packs in the freezer until they are frozen solid. Please note: the different vest sizes include eight (8) to twelve (12) packs. See the size chart below for more information. KITS COME WITH A HAT AND NECK WRAP IN THEIR MATCHING COLORS! Easily to load cold packs. Balanced weight. Length/width adjustable. Cools most of torso. Easy zipper front. Not too stylish. Some cool gets out. Yardwork. Gardening. Outdoor theater viewing. Outdoor spectator sports. Fishing. We've had a milder summer, but this vest has still gotten a workout as I have been gardening. It keeps me much cooler. I can work longer with less discomfort. Looking forward to the real test of watching outdoor municipal theater in sometimes stiflingly hot conditions. I bought one for me and one for my husband.